The romance and ancient magnetism of Abu Simbel and its famous temples has captured the imagination of the world and will be a highlight on your Egyptian escapades. Abu Simbel is a village of over 2,500 inhabitants in the Nubia region of southern Egypt. Popular attractions include the Great Temple of Ramses II and the Temple of Hathor. Get ready to feel the majesty of Ramesses the Great with cheap flights to Abu Simbel. The city is served by Abu Simbel Airport (ABS), which is a 10-minute drive from the temples. Abu Simbel Airport serves EgyptAir Express. These ancient towering temples were carved into the mountainside in the 13th century B.C.E. and continue to awe all those who are lucky enough to gaze up at its colossal magnificence. You will not find fine dining restaurants in Abu Simbel, but you will find homestyle cooking that is exotic and delicious. Follow your nose along the main road to find the best restaurants. 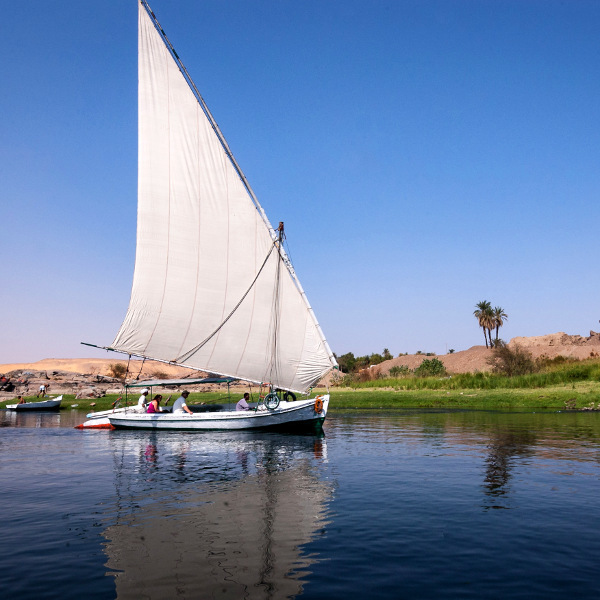 It was on the banks of this great river that some of the oldest civilisations began. A cruise on the river offers amazing views of the legendary Abu Simbel temples and is a great way to explore the riverside towns. The peak summer months are from June to August and bring scorching temperatures. The autumn months from September to November are a bit cooler but can be quite busy. December and January are the peak months for tourists, so the temples become crowded. The spring months from March to May are the sweet spot in terms of weather and crowds. Visiting during the Sun Festival is highly recommended. It happens in February and October and is a spirited festival of traditional Nubian dance performances, street food, and live music outside the temple. For cheap flights to Abu Simbel, the best time to visit is during the summer months from June to August. You will also be able to find good deals during the spring months from March to May. Abu Simbel is a typical Nubian village spread over the hot sands of the Egyptian desert. But this is no regular place. Abu Simbel is home to one of the most breathtaking ancient monuments in the world: The Temples of Ramses II. 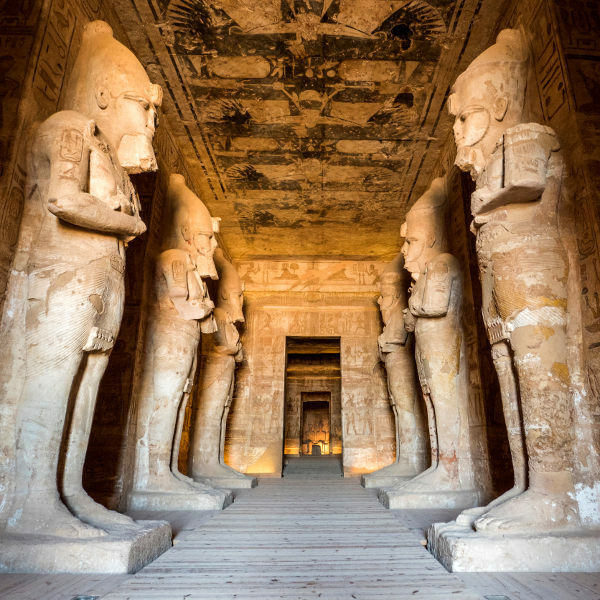 This colossal temple complex draws travellers, history lovers, and romantics from every corner of the globe, all hoping to experience the powerful spirit of Ramesses the Great, the most famous pharaoh in history. The towering temple of Ramesses is one of the most iconic images of Ancient Egypt. The complex is made up of two temples: The Great Temple of Ramesses II, dedicated to the sun gods Amun and Ra-Horakhty, and the Temple of Queen Nefertari, dedicated to Ramesses’ most beloved wife, Queen Nefertari for the worship of the goddess Hathor. The sheer size of the temples is unbelievable, but if you visit Abu Simbel in February or October you will be able to experience the spellbinding Sun Festival. Twice a year (supposedly on the Pharaoh’s birthday and coronation), the morning sunbeams into the temple, illuminating the inner shrine and leaving Ptah, the god of the underworld, in darkness. Everything about a trip to Abu Simbel is unbelievable. Whether you go for a day trip or stay for a few days, this is a journey that you will not forget any time soon. Compare several airlines and book your cheap flights to Abu Simbel online at Travelstart! Abu Simbel is considered a safe city to visit. Keeping up to date with travel advisories for Egypt and obtaining comprehensive travel insurance to cover theft and medical expenses is still highly recommended. Using common sense as you would in any other unfamiliar city is also advisable. The only hassle you may encounter while visiting Abu Simbel is vendors haggling with you to buy things. The best way to handle this is to avoid making eye contact (dark sunglasses work pretty well). Some standard safety measures include remaining alert when walking around at night and making copies of important documents and keeping the originals in a safe place. It is important that you familiarise yourself with the local laws and customs before arriving in Egypt. Proof of yellow fever vaccination is only required if you are travelling from an infected country. Recommended vaccinations include hepatitis A & B, typhoid, and rabies. Routine vaccinations include measles-mumps-rubella (MMR), diphtheria-tetanus-pertussis, varicella (chickenpox), and polio. 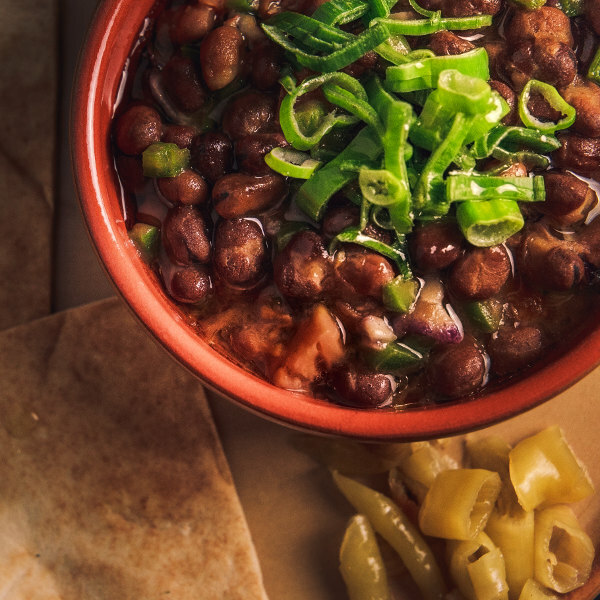 Stick to bottled water and ensure food is served piping hot when dining out in Abu Simbel.